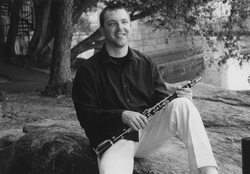 Samuel Caviezel, Associate Principal and Eflat Clarinetist of the Philadelphia Orchestra, was born in Seattle and grew up in the Puget Sound region of Washington State. He began his clarinet studies with Laurie DeLuca of the Seattle Symphony, progressed through the Tacoma Youth Symphony Association, and spent his senior year of high school at the Interlochen Arts Academy in Michigan studying with Deborah Chodacki. In 1992 he entered the Curtis Institute of Music, where he trained with then-Philadelphia Orchestra Associate Principal Clarinetist Donald Montanaro. Upon graduation, he joined the Grand Rapids Symphony as Principal Clarinetist, returning to Philadelphia two years later under the baton of Wolfgang Sawallisch. When not performing, or spending time with family and friends, he enjoys reading, gaming, and the occasional cigar. Sam also is an adjunct faculty member at Temple University.